As a warmup for ECO12, I would like to present 3 smart green startups from Germany that are in a unique position to be successful on the global Cleantech market. They have unique technology, achieved major milestones and look for strategic investors, partners and clients to enter new markets and grow faster. Let’s take a closer look at SolarFuel (Power to Gas), Heliatek (Organic Photovoltaics) and Flinc (Realtime Ride Sharing). 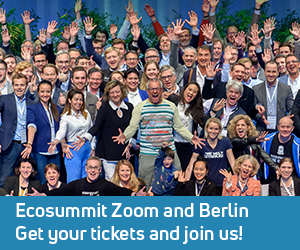 All 3 startups are nominated for the ECO12 Award and join Ecosummit 2012 on 22-23 March in Berlin. Stuttgart-based SolarFuel is the global Power to Gas (P2G) first mover. SolarFuel is capable of providing an integrated P2G solution and well positioned to pioneer the new multi-billion Euro market of converting renewable energy to renewable methane (synthetic natural gas). Power to Gas is useful for storing and transporting huge amounts of energy by coupling the electricity and gas networks to create the smart green super grid. The motivation for developing the new P2G technology is driven by the volatility of wind and solar – the wind doesn’t always blow and the sun doesn’t always shine – and the resulting need for huge long-term energy storage. The potential storage capacity of Germany’s gas network could power the country for several months. The startup integrates technology and know-how developed by Germany’s research institutes ZSW (Centre for Solar Energy and Hydrogen Research Baden-Württemberg) and Fraunhofer IWES (Fraunhofer Institute for Wind Energy and Energy System Technology). The P2G pathfinder is backed by 2 strategic investors – juwi and MT Energie – and has a visionary automotive customer – Audi. Audi plans to offer CO2 neutral mobility by investing in four 3.6 MW offshore wind turbines and buying a 6.3 MW P2G factory from SolarFuel in a 2-digit million Euro deal. SolarFuel’s Power to Gas factory will be operated by EWE and go online in 2013 by the time the new A3 TCNG car powered by compressed natural gas (CNG) hits the market. Audi’s end-to-end plan for balanced mobility is to produce the same amount of gas used by the Audi cars with wind energy that is converted to renewable gas and fed into the gas network. This small but powerful ecosystem proves that Germany is a global leader in Power to Gas technology. P2G creates a huge national market and can also be exported to help other nations accelerate the transformation to the 100% renewable energy system. To support this huge potential for faster energy autonomy, governments should establish feed-in tariffs for renewable gas made at home and minimise gas imports and dependency from foreign resource owners. Unfortunately, today’s electricity grids don’t yet have sufficient capacity to carry all renewable energy during strong wind and bright sunshine. The result is that quite often wind and solar parks have to be switched off as the grid is overloaded. What an incredible waste of energy. It is smarter to use the green electricity for electrolysis, splitting water into hydrogen and oxygen, followed by methanation, combining carbon dioxide and hydrogen into methane. The methanation can either use a chemical process (Sabatier process) or, as Alexander Krajete showed at ECO11, a biological process feeding CO2 and hydrogen to methane-producing microbacteria called Archaea. The renewable gas made in Germany can be stored and transported in the massive gas network and its distributed gas tanks. If needed, the gas can be burned on-demand in gas-fired power plants, in CNG cars or households. The efficiency of P2G is 60% and 35-40% if you convert power to gas to power (P2G2P). This loss during energy conversion is compensated for by the planetfriendly advantages of long-term power storage, the ability to produce gas from renewable sources wherever you want and the flexibility of transporting energy on power and gas grids. Plus, gas is a lot more climate friendly than coal. P2G is a brand new technology that is very complex and still rather expensive. During the next decade it can be made affordable and brought to the mass market by riding down the cost curves. I am convinced that Power to Gas is a huge business opportunity for risk taking startups and Vcs. The more I learn about this company, the more I like it. Dresden-based Heliatek is a world leader of Organic PV (Organic Photovoltaics) and they are getting ready to prove it. The startup is backed by Wellington, RWE, Bosch, BASF and eCapital. On 12 March 2012, Heliatek inaugurates its 2-3 MW FAB 1, the first factory in the world for OPV panels with a roll-to-roll vacuum production process. “For our next-gen organic solar cells we had to invent a totally new production system,” says Heliatek’s CTO Martin Pfeiffer who recently won the Deutscher Zukunftspreis 2011, together with Karl Leo (TU Dresden) and Jan Blochwitz-Nimoth (Novaled). Recently, Heliatek’s OPV panels achieved the OPV efficiency world record of 9.8% testified by Fraunhofer ISE. In 2012, 11% efficiency in the lab is feasible and the efficiency roadmap forecasts reaching 15% within 5 years. Once economies of scale are at work, Heliatek’s new OPV panels will provide more energy for less money while consuming very little resources during production. In fact, using only 1 gram of material for 1 square meter of OPV panel means that Heliatek has the most ecofriendly solar technology in the world. Due to being material-efficient and lightweight, OPV can take solar to places where it has never been before. Among Heliatek’s target industries are automotive, buildings, consumer electronics and fashion. In the near future, we will see cars with Organic PV skins, smart green buildings with semi-transparent blue or green facades and windows, foldable green mobile device chargers and new functional fashion that heats you up or cools you down thanks to its new hybrid climate energy control fabric. Heliatek’s new CEO is Frenchman Thibaud Le Séguillon. Thibaud joined Heliatek because of its disruptive technology and huge market potential. For a sales pro like Thibaud this is the perfect mix. Thibaud follows a blue ocean strategy based on the value innovation that is possible when merging new technology, new markets and new products. This allows Heliatek to sell their goods at premium prices. Kleiner, VantagePoint, Khosla, RockPort and DFJ take note: Heliatek plans a new funding round in 2012 to raise €50M for its 50 MW FAB 2. A multi-billion dollar market is waiting to be conquered and 3G Solar made in Germany volunteers to do the job. We live in a service economy and sharing economy. Both trends grow continuously. Using products on-demand as services enables green consumer behaviour. Sharing products is ecofriendly as more users can be served with less products. Ergo we could produce less stuff. Sharing is especially attractive when we share goods whose production is expensive and consumes a lot of resources. This is the case with cars. To minimise the global carbon footprint of car-based transportation we need not only less cars on the street, but also more users per car. Ubiquitous car sharing maximises the number of users per car while ubiquitous ride sharing optimises the number of users per ride. Thus sharing rides in shared cars is the planetfriendly and pareto efficient optimum. Sustainable social mobility is hot. 4 startups offer peer to peer (p2p) car sharing in Germany: Tamyca, Autonetzer, Nachbarschaftsauto and Rent-n-Roll. When it comes to ride sharing, Ludwigshafen-based Flinc leads the wolf pack. Flinc’s GPS-based ride sharing service connects drivers and passengers in realtime, has 45K users, works on iPhone and Android and is integrated with several navigation systems. A new feature to be implemented is mobile payment which elevates sharing rides to become a super convenient cashless experience. Internet-based ride sharing providers Carpooling.com (backed by Earlybird) and BlaBlaCar (backed by Accel) already have millions of users. Easy-to-use mobile apps make ride sharing very spontaneous and will ultimately grow this market tremendously. Moreover, ride sharing can be integrated with other services. myTaxi, another very useful mobility service, with backing by car2go and T-Venture, is the new taxi centre for the Mobile Economy. myTaxi reduces the number of empty KMs for taxi drivers and thus increases daily revenues while reducing useless carbon emissions. Imagine an integration of myTaxi and Flinc to enable realtime taxi ride sharing. As Taxi KMs are the most expensive ones, this service is bound to be very popular. Car and ride sharing can also be made green if customers are offered the car with the lowest carbon footprint first. 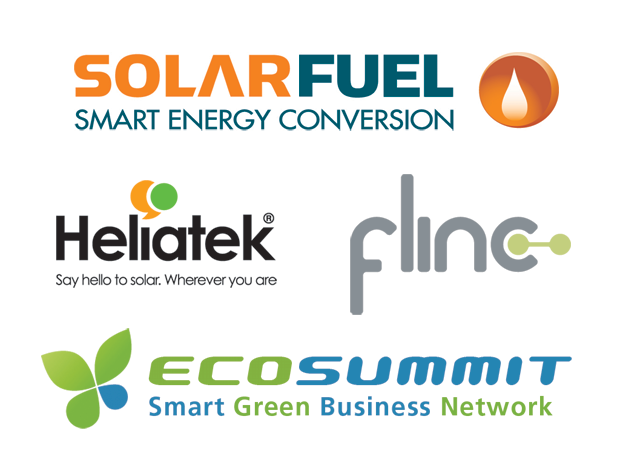 To sum up, SolarFuel, Heliatek and Flinc are smart and green and definitely 3 startups worthwhile to do business with. Many more upcoming startups will be at Ecosummit 2012 and I hope that you join us to co-develop the smart green business of the future.